is like a hug without a squeeze. is like a road not on the map. In other words, your mobile website will get more use when combined with our native app, Crib Sheet. – Discovery of mobile websites is difficult. Mobile websites are not listed in app stores. Native apps are. – Return visits are clunky. To return to a mobile website, users have to remember and type in a URL address, or go through a messy process to bookmark it on their mobile browser. Native apps, on the other hand, are easily accessed via app icons that live on your phone. 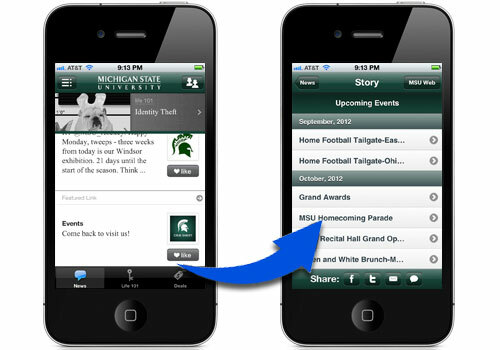 Features appear every third item in our news feed and can direct users back to any mobile website (or any website). Since users enjoy returning to Crib Sheet to get updates on their alma mater’s football team, alumni events, or whatever, they’ll always see your features interspersed in their feed. 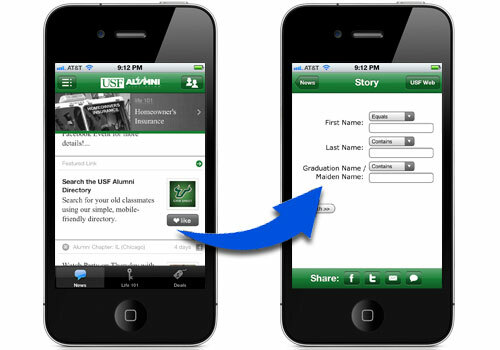 If your alumni are visiting your website from a mobile device, you need a mobile website. If you want more traffic, consider our app as a useful and complimentary “portal” to keep them coming back time and time again.